SEOPressor plugin will help you with the On-page optimization of your blog posts and pages. It will also create a SEO Score on the basis of On-page activities that are done. It’s an easy to use SEO plugin which is a must have plugin for WordPress users. Unless you’ve access to great tools or an in-house SEO expert, SEO can be really scary and takes a ton of your time to get the results you want. That’s why taking help of some of the incredible SEO tools can really help you in saving your time and money. Unfortunately, there are so many tools out there and it’s always a daunting task to pick the best one among them. In this SEOPressor connect review post, we’ll discuss about one of the best optimization tools to increase your website’s SEO. Sometime back SEO Pressor was included in the list of top 10 Premium Plugins for WordPress by Sitepoint.com website here. You can judge about the effectiveness of SEOPressor Plugin by the fact that currently more than 10 million WordPress pages are powering SEOPressor plugin. How the SEOPressor interface looks like? What About The Pricing of SEOPressor? SEOPressor is widely used for one simple reason: it helps you easily optimize your content so you can get more visitors from search engines to your sites. What is on page analysis? Analysing all the factors that affect your search rankings within your website (content, keywords, optimization etc) is known as on page analysis which is a must if you want to get higher rankings on Google. Although there are too many tools out there for on page analysis, nothing comes closer to SEOPressor. With it, you can easily optimize your blog posts or pages to get better search rankings. Let’s talk about each one of them now so you can better understand about those features in this detailed SEOPressor review for 2019. SEOPressor gives a score (0 to 100, 100 being the best) for every post you write on WordPress. Your goal should be increasing your score higher (although you don’t have to get a score of 100 for every post you publish, aim for 80 or above) if you want better rankings. As you can see above, for an example post, it gave 83% score which is really good. The higher your score is the better chances of increasing your rankings on Google for the keywords you’re trying to rank for. This plugin gives you great suggestion recommendations to optimize your blog posts naturally. Have a look at the following image for better understanding. In the above example, you can see that the plugin is giving us so many suggestions to optimize the content better for search rankings. It tells you how to properly optimize your content by also giving you suggestions on where to put your keywords for higher rankings (title, meta description, h1 tags, image alt tags etc). It also warns you if you’re doing keyword stuffing (using the same keyword too many times). This feature gives you all the LSI keyword recommendations that you can use within your blog posts. And it also tells you all the LSI keyword suggestions that you missed using within your content. We’ll talk more about this feature in detail below. So there you go. SEOPressor is one of the best tools for content optimization and helps you quickly increase your search rankings even if you’re new to SEO. If you want to increase your website traffic, you need to do one thing repeatedly and that is conducting site audits. If you are following Bloggers Passion blog posts for a while, you might already heard about site audit and we also discussed about how you can use SEMrush to perform site audits easily. But performing site audit is not easy. Either it takes a lot of time or you need to get access to expensive tools like SEMrush. Here is where SEOPressor comes into handy that you can use to easily conduct site audits and check your website score easily from WordPress dashboard. 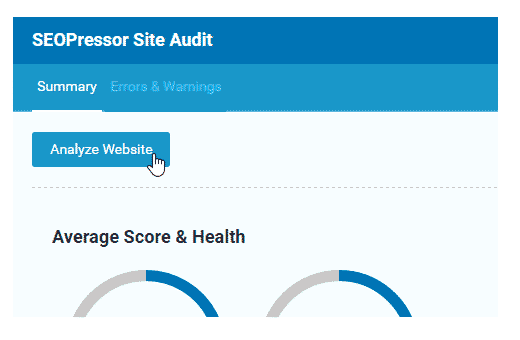 Once you’ve installed SEOPressor WordPress plugin from your dashboard, go to Site Audit section from SEOPressor interface and click on Analyze website button. Immediately it will start analysing the average score and health that you can see below. In the above screenshot, you can notice that, SEOPressor gives you both errors and warnings that you need to fix immediately for better website score. You can click on View All on each one of them and start working on them one by one to improve your score for getting higher rankings on Google for your website. It’s important for you to know that working on errors should be your first priority (you can ignore warnings as they are not so much critical). You can use “Fix This” section and work on all the errors and warnings given by SEOPressor to better optimize your content and website. If you want to get better search rankings on Google, start using LSI keywords. We recently wrote a detailed guide on finding LSI keywords for SEO, so go check out the post. If you want to find highly profitable LSI keywords, SEOPressor can help you with that. For example, have a look at the image below. What do you see above? SEOPressor has an in-built LSI keyword suggestion feature that gives you automatic LSI keyword recommendations that are highly relevant to the keywords you are targeting. Although there will be some mismatch or completely irrelevant keyword suggestions can occur so make sure to use your brain while using the LSI keyword suggestions. Quick tip: If you want to get more out LSI keyword research, apart from SEOPressor, also use tools like SEMrush, LSI Graph etc as they give a ton of more LSI keyword suggestions compared to this tool. Overall, this is a great tool for finding and using LSI keywords automatically within your content to boost your search rankings. Do you want to manage your backlink profile like a pro? If yes, give a try to SEOPressor as it gives you all the features of managing your links like an SEO expert. What do you notice from the above illustration? SEOPressor helps you easily find the status of all your links. If any one of them are broken or not active, it will easily help you find and fix broken links. That way you can fix all the broken pages or posts from your website. Did you know that using SEOPressor, you can automatically insert a designated URL to your keyword in each post or page you create? Yes, it’s possible and easy to do that. Just go to Link Manage from SEOPressor interface and click on Automatic Smart Linking section to set up your links. In the link policy from SEOPressor “Sitewide SEO” section, you can manage all your outbound aka external links easily. You can turn your external links to posts and images nofollow with the click of a button and also you can make them open in new tabs (which is recommended for external links so you can also reduce your website’s bounce rate). If you are interested in SEO, you should know one thing and that is social media is SEO and SEO is social media. Both SEO and social media goes hand in hand. For that very reason this awesome WordPress plugin added a feature called “Social” where you can easily share your blog posts on major social media sites like Facebook and Twitter. You can use both Facebook Open graph and also Twitter cards to easily share your blog content on those two social media platforms really easily and quickly. The great thing about using SEOPressor for social media is You can control how your content should look like. You can control and customise everything from title, URL and images. Just in case, if you’re wondering about how it works have a look at the screenshot provided below. Likewise you can also do the same thing with twitter cards so you can easily promote your blog content on Twitter as well. So what are you waiting for? Just go give it a try to this awesome plugin called SEOPressor. In case if you’re wondering how the SEOPressor looks like, let us give you a glimpse of it. SEOPressor control panel shows you 3 primary things which are; ‘Word Count‘, ‘Readability Score‘, and ‘SQ Density Score‘. This plugin allows you to optimize your content for up to 3 keywords (you can use long tail keywords or even LSI keywords). Based on the word count, it gives you a readability and SQ (Semantic Quality) density score to help you easily better optimize your blog posts for search engines like Google. Here’s how the dashboard looks like (inside of SEOPressor plugin). So there you go. That’s how SEOPressor interface looks like. Easy to manage and use it to better optimize your content for search engines, right? Here’s a list of all the pros and cons of using SEOPressor SEO plugin for WordPress sites. Here are some of the benefits of using SEOPressor over other SEO tools. Simple to use. All you need is a self-hosted WordPress site. Buy the licence of this tool and you can instantly download this plugin and then simply activate to start using it for website optimization. You can easily monitor your website’s backlink profile and make any changes to them need from one place. Here’s a list of some of the cons of using SEOPressor. It’s not a complete SEO package unlike SEMrush. You can use this plugin mainly for on page optimization to get more search engine traffic to your sites. You can target up to only 3 keywords per post. That’s a big disadvantage if you’re someone like us who writes really detailed content by focusing multiple keywords (sometimes 10 LSI keywords per post). Here are all the incredible features that you get with this awesome SEO plugin. On page analysis: You can use this feature to perform multiple keywords analysis, over optimization check, LSI keyword suggestions etc. It gives you everything you need to optimize your content well for both humans and search engines. Semantic builder: You can manage all your scheme settings along with social media settings like Facebook open graph etc. SEO intelligence: You can perform site audits to find and fix all the technical related SEO issues on your website. Multiple keyword analysis: You can target up to 3 keywords at time for each post to properly optimize them for search engines and your target audience. XML sitemap generator: This helps you generate sitemaps for your sites without additionally installing any other plugins. Automatic smart linking: Helps you add keywords for specific links, so whenever you use those keywords, they will turn into links automatically. Link management: Manage all your links like a pro. Manage all your outbound links and also fix your internal broken links from one place. SEOPressor offers subscription based pricing where you can download and use their plugin to improve your SEO by paying $9 per month (and you can use their plugin on any number of sites with a single license). If you’re someone who’s looking for a powerful SEO tool to improve SEO of a site, this is must have tool in your arsenal. There are no free trials or free version of this SEO tool mainly because it’s a plugin and not really a tool like Long Tail Pro or KWFinder (that you can download on to your PC). Here are some of the questions you may have before trying out SEOPressor, so go through all of them if you’re serious about getting your hands on this plugin to boost your search rankings. 1. Why should I use SEOPressor over other SEO tools? That’s a good question to begin with. If you’re struggling to get more traffic from search engines, you should first start with keyword optimization. Here’s where you need to get access to the right tools like Yoast, SEOPressor etc. SEOPressor is hands down one of the best optimization tools that you can get it at affordable price. 2. What’s the difference between WordPress SEO by Yoast Vs SEOPressor? Both can be used as content optimization tools and both of them are WordPress plugins. WordPress SEO by Yoast is simple and easy to use and great for beginners. SEOPressor in other hand is much more powerful tool for optimization and it takes some time to get a better understanding about all of its features. 3. Can I use SEOPressor it multiple sites? Yes, as long as you’re using a self-hosted WordPress platform, you can use this plugin on multiple sites with a single license. So this tool is a great deal especially if you’re maintaining multiple sites and want to improve SEO for all of them. 4. How long should I use it? Are there any commitments? No, there are no commitments. You’ll have to pay $9 per month and if you want to discontinue the plugin, you can simply deactivate your account and you won’t be charged. As a quick note, it’s better to use it at least for 6 months and see the results by yourself. If you’re still not happy, you can find another SEO tools to grow your traffic. SEOPressor is a premium WordPress SEO plugin that has been around since 2010 and used by thousands of SEO enthusiasts worldwide to improve their traffic and optimize content. Google is constantly coming up with latest algorithm, so does SEOPressor making new changes to their tool to help you better optimize your overall website’s SEO for higher rankings. If you like this detailed SEOPressor connect review for 2019, give it a try. If you still have any questions, do let us know in the comments. Very good post Anil. Though at present I personally do not use SEOPressor or train about this WP SEO plugin, but I used it long back and had really good experience with it. Only thing I want to recommend here to all your readers and newbie bloggers is, do not overuse or be over dependent on any plugin you are using, at least not for SEO. There are many things where you must use plugin but knowing and implementing SEO by yourself will surely help you in long run. I am using wordpress seo by yoast. It is really a great plugin. I as another said use Yoast and it work really great as well as beign free. I have been using this plugin but then switched to Yoast SEO, which is free and does exactly the same things SEOPresser does.